Posted on June 18, 2007	by Linda S.
The Brazilian Dimensional Embroidery Guild has a wonderful site for anyone loving embroidery. If you’re looking for something different to use on FPCs, ATCs this would be lovely. The teaching free patterns with tutorials are here. 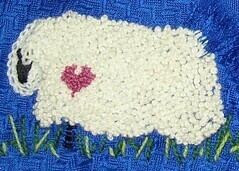 This is a dimensional sheep that I did about 2 years ago. It is made using French Knots with detached buttonhole for the free “flopping” ear. This entry was posted in Embroidery, FPC, Free Patterns, Handcraft, Handwork, Needlework, Quilt, Sewing. Bookmark the permalink. I think I made a brazilian embroidery brooch back in my smocking arts guild days. I probably have all the rayon threads somewhere to do this. Looks like I have another craft to try! no se el idioma ingles pero estoy enamorada de los diseños del brazilian embroidery,soy de argentina .gracias si alguien me contesta.